Yesterday, while searching for an orphan block that I could turn into a center block for our round robin, I found this block - the product of a class I took last September during Quilt Fest (see post about the class here). It was time to turn the block into a wall hanging, and I have just finished the binding. Karen Combs' pattern Chrystal Star has a background and then a border. 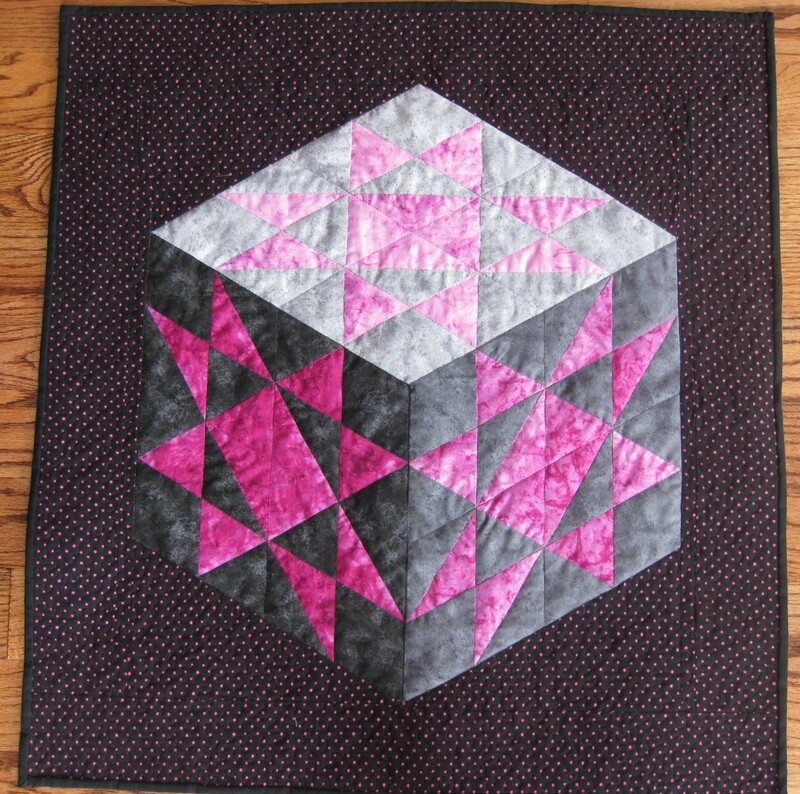 After adding the background, it seemed a good idea to use the same fabric for the border, so that the cube would really seem to float. I had auditioned many fabrics for the background, choosing the black with pink dots because it emphasized the 3-D aspect of the block, and its dots contrasted with the straight lines of the cube. I am happy with my choice. I still need to add a label and the hanging sleeve. However, I feel great about having finished this project after spending two days in bed with a bad cold. While in bed, though, my fingers were busy as I could not really focus on reading because of the headache, nor had I enough energy to sew. I will show you what I worked on on my next post... In the meantime, tell me: Have you made 3-D quilts before? Que bom que já está melhor,essas gripes aparecem e derrubam mesmo.Chegou hoje a tarde o meu lindo prêmio,amei.Obrigada por cartão lindo(vou emoldurar no quarto de costura),papel de presente bonito de doer,obrigada mesmo.Fique bem e se cuide.Beijos e Bençãos.